Escape From Jesus Island is an original full-color, digitally painted comic book series about an attempt to clone Jesus that goes a little off the rails. The ReGen Corporation eventually succeeds in its quest, but only after creating scores of hideously deformed near-Jesus freaks and a monstrous twin brother, Damien. When the Vatican hears of Christ’s return and sends an elite Black Ops extraction team to ReGen’s remote island testing facility, all Hell breaks loose. 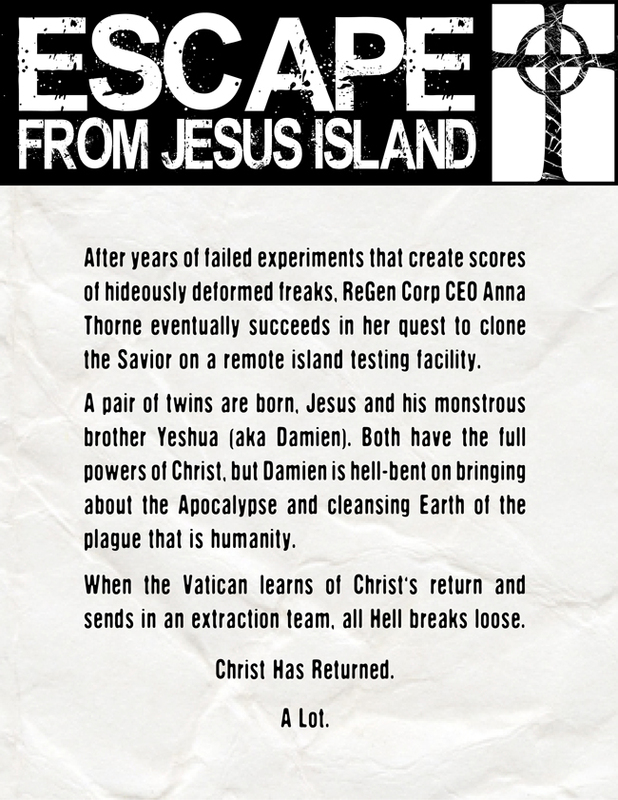 Written by filmmaker Shawn French and illustrated by Mortimer Glum, Escape From Jesus Island is a twisted retelling of the prophecies from the Book of Revelation. Christ, Antichrist, a legion of cannibalistic mutants and, as the series progresses, global carnage complete with the Four Horsemen of the Apocalypse. Our writer has been working on this story for 20 years, so you know we have big goals for this series. The main story is broken up into five Acts of eight issues each, for a total run of 40 issues. Each Act stands on its own, while also advancing the main story. To learn about the four Power Players in the series, visit the Factions section here. Learn more about the story’s main Characters here. To see some of the incredible artwork, including sample pages from the upcoming comic, go here.